Sister Joan Irene Klukaszewski, O.S.F. Sister Joan Irene Klukaszewski entered eternal life on the newly designated Feast of Mary Mother of the Church on May 21 in Temple University Hospital, Philadelphia. She was 82 and in the 65th year of her religious life. She was born in Natrona, Pa., the daughter of Joseph Klukaszewski and Frances Kozlowski. Sister Joan entered the congregation of the Bernardine Franciscan Sisters in August 1953 and pronounced her final vows in 1959. Sister Joan graduated from Mount Alvernia High School, Reading, in 1953, earned a bachelor’s degree from Villanova University in secondary education in 1965, received her master’s degree from the University of Scranton in 1971 and obtained her Principal’s Certification at Immaculata University. 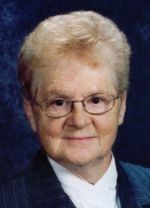 Her teaching career spanned 57 years and she served as an elementary and middle school teacher as well as principal in Pennsylvania schools throughout the Archdiocese of Philadelphia and the dioceses of Scranton and Pittsburgh. After 19 years, Sister Joan concluded her career in education at St. John the Evangelist School in Morrisville after the school was named a National Blue Ribbon School of Excellence in 2008. At the time of her death she was a resident of Our Lady of Grace Parish in Penndel. Her devotion to children and love of education contributed to a successful career as teacher and administrator. World travel complemented her educational experience. Devotion, love of her congregation and simplicity of life style were the driving forces propelling Sister Joan’s life of service to God and to the church. An outstanding example to her fellow sisters endeared her to the hearts of those she served as well as to parents and friends. Sister Joan Irene was preceded in death by her brother, Harry Klukaszewski. She is survived by a sister, Dolores Bombalski, and many nieces, nephews, great-nieces and great-nephews. The funeral Mass was celebrated May 25 at the Motherhouse of the Bernardine Franciscan Sisters, Reading.